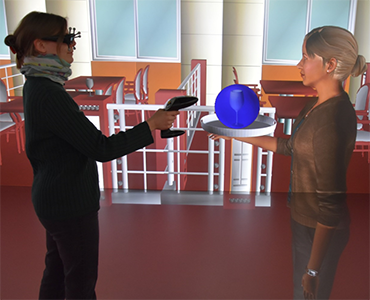 The Virtual Reality and Immersive Visualization Group started in 1998 as a service team in the RWTH IT Center. Since 2015, we are a research group (Lehr- und Forschungsgebiet) at i12 within the Computer Science Department. 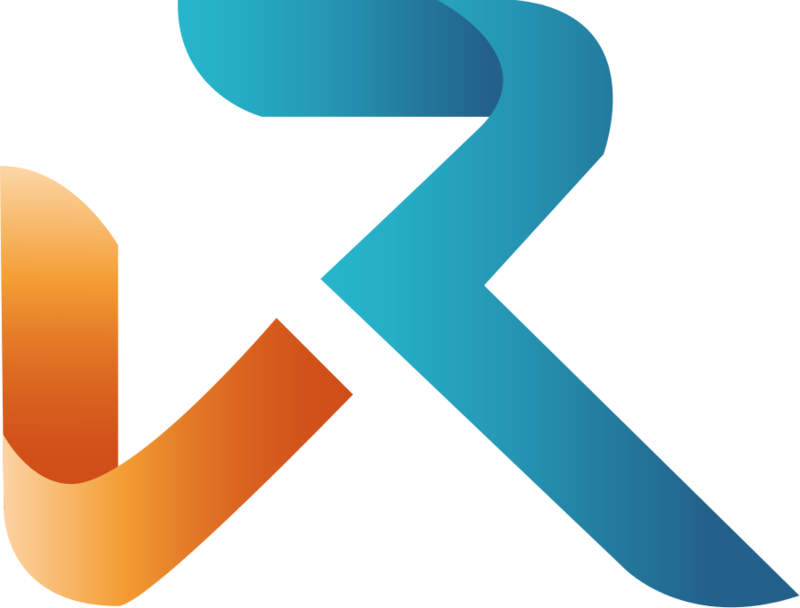 Moreover, the Group is member of the Visual Computing Institute and continues to be an integral part of the RWTH IT Center. In a unique combination of research, teaching, services, and infrastructure, we provide Virtual Reality technologies and the underlying methodology as a powerful tool for scientific-technological applications. 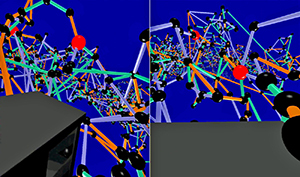 In terms of basic research, we develop advanced methods and algorithms for multimodal 3D user interfaces and explorative analyses in virtual environments. Furthermore, we focus on application-driven, interdisciplinary research in collaboration with RWTH Aachen institutes, Forschungszentrum Jülich, research institutions worldwide, and partners from business and industry, covering fields like simulation science, production technology, neuroscience, and medicine. Our offices are located in the RWTH IT Center, where we operate one the largest Virtual Reality labs worldwide. 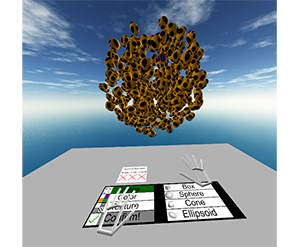 The aixCAVE, a 30 sqm visualization chamber, makes it possible to interactively explore virtual worlds, is open to use by any RWTH Aachen research group. By the end of the lecture period, we had to say goodbye to our dear friend and colleague Benjamin Weyers. For more than five years, he significantly committed to our group’s research and teaching activities with a very high personal involvement. Now, Benjamin took over a junior professorship for Human-Computer Interaction at the Department IV - Computer Science at the University of Trier. We will miss him. However, we wish him best of luck for his new endeavor and the new tasks and challenges ahead. Our warmest congratulations, Jun.-Prof. Dr.-Ing. Benjamin Weyers! ... is ready for take-off and introduces itself to the public with a short video clip on youtube. Of course, VR is involved here as well - as one digital tool used in the development stage to gain initial insights. Today, our colleague Sebastian Freitag successfully passed his Ph.D. defense and received a doctoral degree from RWTH Aachen University for his thesis on "Supported Navigation in Immersive Virtual Environments". Congratulations! Today we had to say goodbye to our dear friend and colleague Tom Vierjahn. After four years of significant commitment and high personal involvement in our group’s research and teaching activities, Tom now takes over professorship at the Department of Business Studies and Information Technology at the Westphalian University of Applied Sciences in Bocholt. We will sadly miss him in Aachen, however, we wish him much fun and all the best for the new tasks and challenges ahead. Our warmest congratulations, Prof. Dr. Tom Vierjahn! At this year's International Supercomputing Conference from June 24 - 28, 2018 in Frankfurt scientists of the JARA-HPC presented latest research results at the exhibition and organized a workshop on In Situ Visualization. Matt Larsen visits our group. Matt Larsen is a staff scientist at Lawrence Livermore National Laboratory. He received his Ph.D. in computer science from the University of Oregon in 2016. He is the primary developer for the ASCENT in situ library, as well as a key contributor to the VTK-m library and the VisIt visualization software. Matt's research interests include rendering for visualization, performance modeling for visualization, and many-core architectures. When designing the behavior of embodied, computer-controlled, human-like virtual agents (VA) serving as temporarily required assistants in virtual reality applications, two linked factors have to be considered: the time the VA is visible in the scene, defined as presence time (PT), and the time till the VA is actually available for support on a user’s calling, defined as approaching time (AT). Complementing a previous research on behaviors with a low VA’s PT, we present the results of a controlled within-subjects study investigating behaviors by which the VA is always visible, i.e., behaviors with a high PT. The two behaviors affecting the AT tested are: following, a design in which the VA is omnipresent and constantly follows the users, and busy, a design in which theVAis self-reliantly spending time nearby the users and approaches them only if explicitly asked for. The results indicate that subjects prefer the following VA, a behavior which also leads to slightly lower execution times compared to busy.